A new favourite. And, it turns out, apropos since Dr. Seuss's anniversary of his birthday just passed this week. 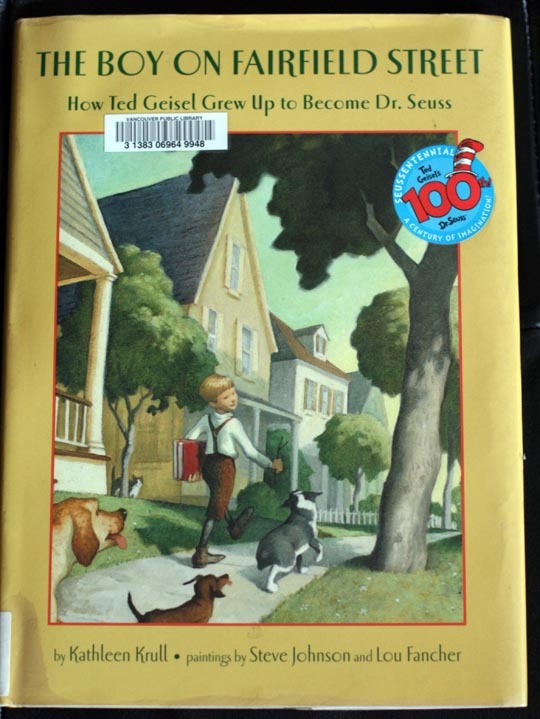 The Boy on Fairfield Street is a wonderfully written account of how Ted Geisel became the iconic children's author he did. It was no straight road either which makes it all the more inspiring. As you can see we found this gem at the library but with its lovely prose and illustrations and inspiring message, this one's worth owning. Oh dear I want it! We love Dr. Seuss and we celebrate his birhday every year since Aj was 2 years' old. Thanks Jackie for this wonderful title, I'm gonna look immediatly for it to find here in Italy. What a wonderful idea! Celebrating him and his work each year. I think you will like the book. I hope it comes in Italian!